Do you want to be part of the history of St Botolph’s? Perhaps you want to support the restoration works & ensure the future the iconic Boston Stump? We have the ideal way you can do all of this! 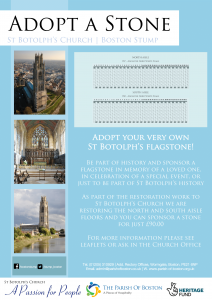 You can now adopt a flagstone which will form part of the new flooring to the north and south aisles of our much loved St Botolph’s Church. For just £90.00 you can be part of history; buy one as a gift, for a loved one or in memory of a loved one. As part of the adoption pack, you will receive a map showing you where your stone is along with a certificate of authenticity. Once all of the stones have been adopted we will place the names and messages, along with the coordinates, in a specially bound book which will sit in our archives so that for generations to come people will know who has adopted a stone. The process is simple; complete one of the forms below and send it to adam.kelk@parishofboston.co.uk or call (01205) 310929 and we will arrange to take payment and post the pack out to you. We will then highlight the stone which has been adopted & put up a notice saying who it is for; this can be seen by the many visitors that come through our door every day [limited time only].